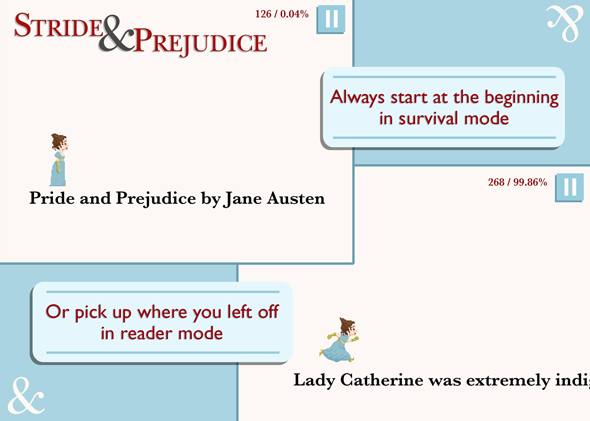 Stride & Prejudice: Can an endless runner game make me want to read Jane Austen? Can a Video Game Make a Dude Like Me Want to Read Pride and Prejudice? Over the weekend, I broke a personal rule of mine: never quitting a book before finishing it. The novel I deserted was none other than the beloved Pride and Prejudice. But before you choke yourselves with your chokers, know that I gave up on my first attempt at reading this novel not because I liked it too little, but because I liked it too much. The fault, you see, lay not in the book, but its method of delivery: It was presented by a new video game, Stride & Prejudice, which is “an endless runner based on Pride and Prejudice by Jane Austen,” per its tagline. This isn’t your usual “based on” video game adaptation of literature, like the 2010 hack-n-slash inspired by Dante’s Inferno, or Slate’s own interactive version of The Great Gatsby. In Stride & Prejudice, the book is the game, its words forming a steady succession of platforms that your character, Elizabeth Bennet, runs and jumps across. It’s a 2-D sidescroller, like Mario, except you don’t have to worry about moving the character forward. Elizabeth runs on her own, so your only task is to tap the screen to jump the gaps between the strings of text rushing your way. must be in want of a wife. What keeps Stride & Prejudice from being just an, ahem, novel take on the endless runner, though, is Reader mode, in which you can “die” infinite times and Elizabeth will reincarnate where she left off. In effect, it’s the book, except with auto-scrolling text and the constant requirement to jump. At 99 cents, Stride & Prejudice is the same price as the Kindle edition of Austen’s novel, except the game saves you from the bother of having to move your eyes to where the words are—what a hassle!—and moves the words move to where you’re looking. Now, it’s easy to give in to the kind of predictable tut-tutting of society that Stride & Prejudice invites at first glance. Two hundred years after this great novel was published, this is the state of pop culture? Have our minds been so fractured by multitasking that we get bored by entertainments that don’t give us “something to do” while we’re being entertained? But my main reaction to Stride & Prejudice is simply: This isn’t a game. Tapping the screen while “playing” Stride & Prejudice becomes as unconscious a process as turning a page, or hell, holding your iPhone, almost immediately. Indeed, the true downside of consuming Pride and Prejudice in this manner isn’t that you’re too distracted playing the game to read the book—it’s having to read at a pace other than your own. You can adjust how quickly the words scroll, but no one reads at a steady, constant speed. “What think you of books?” said he, smiling. So is it a game or a book? “I see it as a gate-way app for both book-lovers and gamers,” she wrote. “Gamers who would never think to read Jane Austen have told me they’re now reading the book, some entirely within the game.” Some. But not me. Fisher accomplished her mission, in that I plan to see where/whom Elizabeth runs to at the end of her not-endless journey (and I have a feeling I know the answer). But it won’t be the pixel-art Elizabeth I see at the finish line, cute though she may be. It will be the Elizabeth whom Jane Austen and I co-create in my mind, at our own pace.